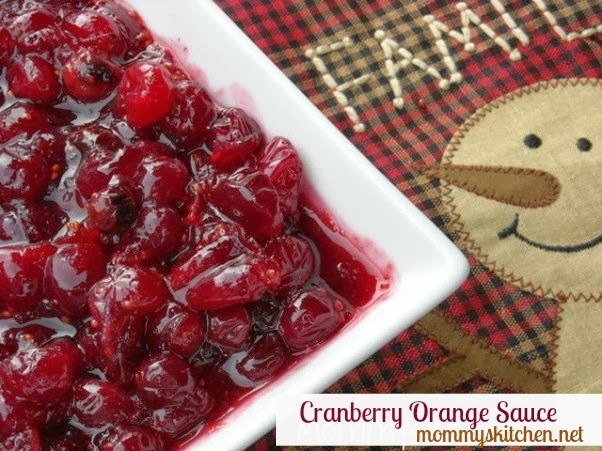 I made this Cranberry Sauce recipe over the Thanksgiving holiday. I canned it up so it would travel well on the trip to my mother in laws house. When I make cranberry sauce I usually just make the regular recipe on the back of the cranberry bag, but this year I wanted to mix thing up a little different. I loved the addition of the orange juice and orange rind. It smelled so good as it was cooking and the orange flavor really came though as it cooked. My husband likes the regular jellied cranberry sauce out of the can. Me, I like whole cranberry sauce. So I usually have to buy both around the holidays. I made this recipe particularly because he loves orange flavoring so I thought he might like this. He told me that it tasted really good and the orange was a nice addition. This will more than likely be the new way I prepare my cranberry sauce. I really enjoyed it and so did everyone at Thanksgiving. I will be making this again for my Christmas Dinner. These are the ingredients you will need: 1 bag fresh cranberries, fresh or concentrated orange juice, orange rind and granulated sugar. Add all the ingredients to a saucepan and mix well. Cook over medium heat and bring to a boil. Boil for 10 minutes until the cranberries pop. I like my cranberries more whole then saucy. This was so yummy I had to put me a bit to the side to eat. Put all ingredients into a sauce an and mix well. Cook over medium heat and bring to a boil. Boil for about 10 minutes until the cranberries pop. There may be a few light colored ones that don’t pop, but don’t worry. They soften as the sauce cools. The sauce can also be made up to 2 days before and kept in the fridge. I canned mine and processed them in a boiling water bath for 10 minutes (half pint jars) Recipe yielded two half pint jars. I just did a search for bloggies on the Pioneer Womans Book signing at Borders and you site was one that came up. I never thought I would be in a photo LOL that was a long awaited night and worth it in so many ways. So glad you liked it! It is the best. It wouldn't be Thanksgiving without it. I tried this same recipe this year for the first time (minus the zest) and was really happy with it as well. I think I'll try that next time I make it. Thanks! Mmm...love cranberry sauce! I have been making one with ginger and orange juice but this year I made one from Food Network's site and it has been my favorite! It uses OJ, orange zest, lemon juice, lemon zest and a diced up Granny Smith apple....wow! Looks really wonderful. I did one this year with tangerine juice/zest. Loved that one too! I started making my cranberry sauce this way a few years ago. It tastes so much better with the orange juice. I've even made this during the year and not only for Thanksgiving or Christmas. YUM! Can i use truvia for low sugar usage? I've made this cranberry sauce several years in a row now, and it's one of my favorite Thanksgiving sides. Wonderful flavor!